200+Senior Decision Makers will Attend! 1. Unrivaled Speaker Line-up: 30+ industry eminent speakers2. Exclusive 20+ hours of supreme networking: Meet up with worldwide leading Automotive OEMs and Tier 1s to build a secure supply chain and sustainable partnerships3. Increase Your Contact Lists: 200 + senior level executives will attend from every sector of the autonomous driving testing and validation area4. Content Rich Programme with World Class Best Practices: Revolutionnary cross-industry discussions; Practical and cutting-edge business advice help your company to develop into the next generation autonomous driving testing and validation 5. In-depth Grasp of the Industry Know-how only in Two Days: Saving your months of research and one by one business visiting! The Chinese government aims for being a leading world cyber power by 2035 and the autonomous vehicle segment is a core part of this strategy. The Chinese government has begun to show strong support for autonomous driving vehicle technology as it begins to fast-track the sector in China. Now China’s Ministry of Industry and Information Technology (MIIT) is working on a draft bill for autonomous driving. The mandate from the central government is that 50% of all new vehicles sold in China by 2020 must have partial or full autonomous functions, state media reports quoting the National Development and Reform Commission (NDRC). The new draft policy by the MIIT is to be released soon, and will be followed by local provincial and city government announcing policies to enhance and fast-track the segment. China to spearhead US$1 trillion autonomous driving revolution. 290 cities have initiated ‘smart-city’ pilot projects, including 93 that are focused on mobility that could potentially use infrastructure interlinked by software to allow driverless cars, or autonomous vehicle and shared-driving models. A statistic represents the projected size of the autonomous driving market in China from 2016 through 2021. In 2016, the Chinese autonomous driving market was sized at around two billion euros. Globally, this market is expected to grow from 9.5 billion euros in 2016 to 39.6 billion euros in 2021.However Autonomous cars have some major hurdles to overcome before they become part of the transportation landscape. including the Cost – How to achieve economies of scale so that technology moves to mid tier segments where volumes are there; Standardization – Lack of interoperability for Radar, Lidar, Vision data in car network; Regulatory – Regulation for Autonomous cars are evolving. There is no clear standards for testing, certification of autonomous cars, safety regulations, definition on “Who is liable in case of a mishap…”; Validation – lengthy validation cycles; As per the report from Rand corporation titled, “How Many Miles of Driving Would It Take to Demonstrate Autonomous Vehicle Reliability?”, it would take 275 million miles/12.5 years of driving to demonstrate with 95% confidence that the failure rate is at most 1.09 fatalities/100 million miles. This is a long validation cycles and there is a need to adapt non-traditional ways to accelerate validation of autonomous vehicles.Testing and validation has become a big concern for autonomous driving technology readiness. 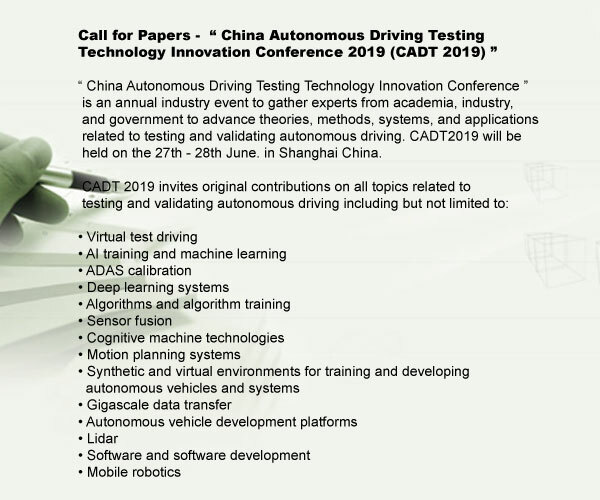 The China Autonomous Driving Testing Innovation Conference 2018 will address those challenges and solutions for you to faster product maturity and bringing safer autonomous vehicles to market much faster than anticipated. Ideally located in the former French Concession, near Huaihai Road Central Business District, the Jin Jiang Tower Shanghai (Shanghai Xinjinjiang Dajiudian) enjoys a most convenient traffic, close to Xintiandi and People's Square. As the flagship hotel of Jin Jiang Hotels Group, the largest hotel group in China and Asia, the hotel is one of the best venues to overlook downtown Shanghai. A hotel chosen by more than 370 heads of state, foreign dignitaries and celebrities, tells you something about the exquisite service and experience you will have in this hotel.All of 582 brand-new elegant rooms and suites offer a 360° bird's-eye view of Shanghai. Unique "Oriental Dream" and deluxe goose down bedding take care of your sleep. Digital Deluxe Rooms are well-appointed with a cutting-edge digital system, multifunctional with a flat screen TV, high-definition channels, video-on-demand, PC and broadband Internet. The new executive floor, Villar House features broad spaces ranging from 60 sq m(645 sq ft) to 400 sq m (4305 sq ft) and super-wide windows. The Villar Executive Lounge on the 40th floor ensures you comfort, privacy and butler services, and the 360° outdoor sightseeing platform offers you memorable panoramic scenery of Shanghai.The Jin Jiang Tower has a surplus of restaurants and bars serving a delicious variety of food prepared by the hotel's chefs. The newly-opened Semillon Café offers wide selections of seafood, steak and dessert for buffet. You will also still find Sichuan & Shanghai Cuisine at Le Fun, classic Cantonese Food at Exquisite Bocuse, Japanese BBQ at Xiao Nan Guo. The brand new J-Show Club, on the 34th floor, creates a unparalleled space with private dining rooms, fancy Modern China design and splendid landscape for most luxurious banquets. Overview of 3M China Founded in 1902, 3M is headquartered in St. Paul, Minnesota, USA. As an innovative corporation, 3M has developed a wide range of technologies and products that improve our daily lives. Total 70,000 high-quality products over the course of 100-plus years, 3M’s products range from household to healthcare, from transportation, construction to business, education, electronics and telecommunication, and so on. Registered in China in November 1984, 3M China was the wholly foreign-invested enterprise early established outside the Shenzhen Special Economic Zone. To date, 3M has established 9 manufacturing facilities, 27 branch offices, 4 technical centers and 2 R&D centers, with more than 8,200 employees. As one of the first foreign-invested enterprises registered in China, 3M China has achieved rapid growth over the past 30 years, in tune with the rhythm of China’s economic development. Holding “In China, For China” as its core strategy, 3M has greater involvement in the development of Chinese economy by leveraging its diversified technologies and multiple solutions. From infrastructure construction to manufacturing, from “Made in China” to “Created by China”, from export-driven growth to boosting domestic demand, 3M rides on the tide of China’s economic development by keeping in step with and helping drive forward the Chinese economy, making it one of the most successfully localized companies in China. 3M China is dedicated to the development of innovative technologies and products that meet local customers’ needs. It also focuses on fostering local innovative talents. 3M China now has nearly 600 R&D employees, which have contributed to around 1,000 patents and plays a significant role in 3M’s R&D network. 3M China actively participated in the social responsibility events including environment protection, poverty alleviation and volunteer activities. 3M’s continuous efforts to the society have been widely recognized, proved by an extensive list of accolades. It also got selected for and ranked top on the "Fortune 500 Companies’ Contributions List in China" for several times. Introduction of OTSLFounded in 2003, OTSL is a technology company that provides high technological capabilities by planning and developing embedded systems, real-time systems, and short-distance wireless communication systems. Its corporate philosophy is "to contribute to the development of human beings by logical thinking and provide highly reliable systems to help customers create products that make people's lives richer." Its business activities include system development, software development, consultation on quality assurance, and provision of educational services. Its aim is to provide a wide range of support to help advanced companies take advantage of the technological benefits of information technology and advance their products and services using their technological advantages. Konrad Technologies is a subsidiary of a professional Germany automation test system integrator, Konrad GmbH, which was founded in 1993. As a professional automation test system integrator and the platinum partner of National Instrument, Konrad Technologies core business area embraces development, design and integration of customer-specific test solutions providing customers with R&D, qualification and manufacturing of electronic products with tools to fulfill their quality goals.So far, we have provided solutions for customers in consumer electronics industry, aerospace and defense industry, Automotive Industry, Household electronics industry and Semiconductor industry. Till now, there are more than 1000 Konrad testing systems running in China. AImotive is the largest independent team in the world working towards fully self-driving car technology. Our unique toolset is engineered to answer all the challenges of autonomous mobility, powered by advanced artificial intelligence, simulation technology, and supporting hardware architectures. This complex approach to self-driving car technology allows our team to develop systems quickly in the safest possible way.Our team currently has over 170 members. The company has offices in Helsinki Finland; Mountain View, California; and Tokyo, Japan. The bulk of our development happens at our headquarters in Budapest where a team of 130 highly skilled engineers spearheads our efforts. Among them are thirty specialized artificial intelligence researchers, while 15+ members of our team hold PhDs. 1：Beijing Autoroad Tech Co., Ltd., founded by accomplished elites in this industry, is a high-tech company focusing on millimeter wave and sub-millimeter wave radar technology. The core technical team has been engaged in the R&D of radar technology for over 10 years, having obtained experience for major projects in the field of phased array technology, space-time adaptive technology, radar signal processing technology, electromagnetic simulation technology, microwave testing technology, micro-assembling and processing technology. Now Autoroad has mastered many key technologies such as the designing of 77Ghz-millimeter-wave remote and medium-range anti-collision radar system, millimeter-wave radar array antenna, the detecting of radar signals, the recognizing and tracking of targets as well as millimeter-wave and sub-millimeter wave radar SAR imaging technology. 1：BBK Test System Co., Ltd. is a high-tech enterprise specialized in providing test and test systems and related solutions for the automotive, civil engineering, railway, nuclear power, marine, communications and other industrial industries. The company's headquarters is located at the Jinqiao Science and Technology Industrial Base at the southern end of the Yizhuang Development Zone in Beijing. It has more than 12,000 square meters of office and production base. The company is a high-tech enterprise in Beijing, a high-tech enterprise in Zhongguancun, and a tax-credit-A company. The company has passed ISO9001:2015 quality management system certification. After more than 10 years of steady development, Brocade has accumulated strong technical strength and broad market resources. It has become an influential supplier of advanced R&D test equipment for automotive production quality control and automotive and structural applications. BBK Test provide users with total solutions and complete turnkey projects. The main business includes research, development, production and sales of test and test systems and related equipment in the automotive and other fields, and provides related system integration, upgrades, transformations, and maintenance. User training and other technical services. 1：Neusoft Reach is an innovative company which focuses on creating next generation automotive technologies and mobility solutions. Our technologies and products include New Energy Vehicle traction battery systems, intelligent charging system, advanced driver assistance system, autonomous driving system, connected vehicle technologies and products based on cloud computing and big data platform. We actively innovate in the areas of electrified, automated and connected mobility service model, strive to contribute to the automotive industry with quality products and innovative solutions. 1：Continental develops pioneering technologies and services for sustainable and connected mobility of people and their goods. Founded in 1871, the technology company offers safe, efficient, intelligent and affordable solutions for vehicles, machines, traffic and transport. In 2017, Continental generated sales of €44 billion and currently employs more than 238,000 people in 61 countries. This is Continental's official LinkedIn account. The purpose of our page is to offer information about career opportunities at Continental AG, about our technologies, company culture and about our actions and initiatives. We emphasize the importance of an appropriate and respectful style when communicating on our page and therefore we reserve the right to delete comments that are offensive or suggestive, personal attacks, anonymous, wildly off-topic, spam or advertisements. 1：We make vehicle automation systems for all-year round use, even for harsh Nordic winter conditions and extreme environments. Our approach, algorithms and software take self-driving where no autonomous vehicles have gone before. Our SAE level 4 solution is based on integration of artificial intelligence and sensor fusion. Our application knowledge in the real within-traffic self-driving pilots, mobile robotics and northern survival knowhow makes Sensible 4 the toughest vehicle automation system out there. Welcome to the age of Snowtonomous technology. 1：With the Audi and Lamborghini brands, the Audi Group has long been one of the most successful car manufacturers in the premium and supercar segment. Since 2012, motorbikes from the traditional Italian brand Ducati have supplemented the range. Furthermore, the Audi Group also supplies other Volkswagen Group brands to customers via sales companies. 1：Founded in 1958, Beijing Automotive Group Co., Ltd. ("BAIC Group") is headquartered in Beijing and has 130,000 employees. We are a major automobile group in the Chinese automotive industry, and a world Fortune Global 500 enterprise. We have developed a complete industrial chain, covering R&D and manufacturing of vehicles (passenger vehicles, commercial vehicles and new energy electric vehicles) and parts, trade of automobile services, comprehensive mobile services, finance, investment, etc. We have realized an strategic business extension to sectors such as general aviation, becoming a large state-owned automobile group with the most complete range of products, the most complete industrial chain and a leading position in the new energy automobile segment in the Chinese automobile industry. 1：Headquartered in Zhengzhou of central China’s Henan Province, Zhengzhou Yutong Group Co., Ltd. (hereinafter referred to as “Yutong Group”) is a large-scale industrial group mainly specialized in the bus business, and also covers some other strategic businesses such as construction machinery, automotive parts and components, real estate and so on. In 2016, the Yutong Group totally delivered 73,703 units of buses and construction machinery, up 4.4 percent year-on-year. The turnover of Yutong Group reached 45.2 billion yuan, a rise of 8.1 percent than the previous year, continuously ranked first in China’s bus industry in terms of the enterprise scale and sales performance. 1：Navistar International Corporation (NYSE: NAV) is a holding company whose subsidiaries and affiliates produce International® brand commercial and military trucks, and IC Bus™ brand school and commercial buses. The company also provides truck and diesel engine service parts and financing services. Navistar has four operating segments: North America Truck, North America Parts, Global Operations and Financial Services. 1：At General Motors, we are passionate about earning customers for life. This vision unites us as a team each and every day and is the hallmark of our customer-driven culture. In fact, there are a lot of exciting things to share about our company. Our story starts on November 18, 2010, when we completed the world’s largest initial public offering, emerging with a solid financial foundation that enables us to produce great vehicles for our customers and build a bright future for employees, partners and shareholders. Leading the way is our seasoned leadership team who set high standards for our company so that we can give you the best cars and trucks. This means that we are committed to delivering vehicles with compelling designs, flawless quality and reliability, and leading safety, fuel economy and infotainment features. All are intended to create that special bond that can only happen between a driver and their vehicle. Making the world’s best vehicles can only happen with the world’s greatest employees. We take great pride in our work, and take great care to deliver exceptional cars and a positive ownership experience to our customers around the world. 1：Chongqing Changan Automobile Company Limited, together with its subsidiaries, manufactures and sells automobiles, automobile engines, and spare parts primarily in the People’s Republic of China. Its principal products include sedans of CS series SUV, Raeton series, Eado series, and Alsvin series; and Oushang, Honor, and Eulove MPV products. It also engages in the car rental and after-sale service activities; design and development of powertrain; and sale of auto parts. The company was founded in 1862 and is based in Chongqing, the People's Republic of China. Chongqing Changan Automobile Company Limited is a subsidiary of China Changan Automobile Industry (Group) Co., Ltd.
1：SAIC Motor Corporation Limited (SAIC Motor) is the largest auto company on China's A-share market (Stock Code: 600104), and has a total equity of 11.683 billion shares. SAIC Motor strives to grasp the trend of industrial development and speeds up the innovation-driven industrial transformation, and it is growing into a full-range vehicle products and travel services provider from a traditional manufacturing enterprises. SAIC Motor's business covers the research, production and vehicle sales of both passenger cars and commercial vehicles. The company is actively promoting new energy vehicles, the commercialization of Internet-connected cars, It is exploring intelligent driving technology research and industrialization of exploration. It is mainly engaged in the R & D, production and sales of parts for motor drive system, chassis system, interior and exterior decoration, battery, electric drive, power electronics and other new energy vehicles and the core components of the intelligent product system); auto-related services such as logistics, e-commerce, travel, energy saving and charging service; auto-related finance, insurance and investment services; overseas business and international trade; and the layout of industries of big data and artificial intelligence. SAIC's affiliated vehicle companies include Morris Garages, SAIC MAXUS, SAIC Volkswagen, SAIC-GM, Shanghai General Motors Wuling (SGMW), NAVECO, SAIC-IVECO Hongyan and Shanghai Sunwin Bus Corp (SUNWIN). SAIC Motor's car sales hit 6.93 million units in 2017, up 6.8 percent on the previous year and keeping its leading market share in China. In 2016, the company climbed 5 places to rank 41th on the annual Fortune Global 500 list, thanks to its $113.86 billion in revenues. It marked the 13th time that the company had made it onto the list of Fortune magazine's 2016 Global 500.